Hey, guys! 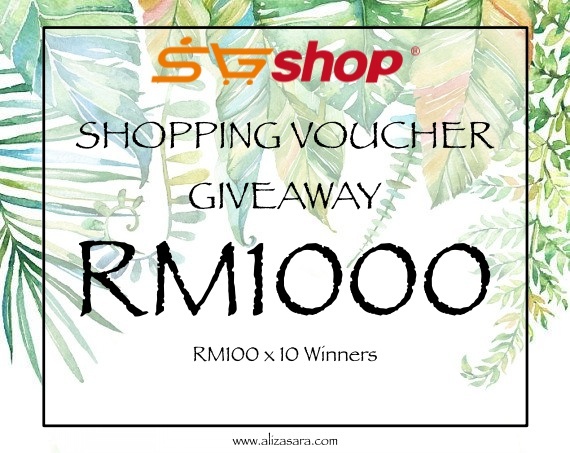 As the title says, if you're joining this contest because you love to shop, well here's your chance to get RM100 worth of Shopping Credits to shop at SGShop. In this blog post, I'll be looking for 10 lucky readers to win themselves a shopping experience to remember! Wondering what SGShop is? Well, SGShop is your online platform to shop worldwide at crazy prices! Believe me when I say its super cheap! But if you want a clearer picture of my shopping experience, why not head on over to my SGShop Haul & Shopping Experience blog post which I'll like it below. Let's cut to the chase. Now, who here wants to win RM100 worth of shopping vouchers?! I promise you that it's super easy and all you need to do is just to follow the instructions below. 3. Leave a comment below by telling me how excited you are and fill in this form via rafflecopter. Psst, if you are still unsure, there will be 10 lucky winners which really gives you a higher chance of winning. So what are you waiting for? With just a few clicks, you're already in the running to win Shopping Credits to shop at one of the CHEAPEST online sites in Malaysia. It's even more exciting when you get to choose your own prize. I don't wanna talk too much so that you can proceed with taking part in this contest. I'm super duper excited to try and shopping at SGShop Malaysia because there are awesome products with the cheapest price. I want to deco my kitchen with my favourite colour, pink. When, i visit SGShop web, i found that are so many pink colour stuff which suitable for my kitchen decorations. So, that's why i'm super excited to shopping at SGShop so that i can buy all the pink stuff using RM100. My birthday is coming. Just two more weeks and I'll be older. Hope can win this and treat myself a bday pressie. Lolsss. Excited eggcited like crazeeee and will make a good birthday gift for me too for end August! I'm super duper excited to try winning this giveaway. If i win Sgshop Shopping credit definitely i will shop at SGShop till i drop.. I am very excited about this giveaway. If I win, it's the first time I will shop at SGShop. I have been too busy and haven't gone shopping for my clothes for a very long time. Already made a list of what to buy with this RM100 worth of Shopping Credits. That is how excited I am! I want to win the vouchers and go shoppinggggg!